For decades tobacco stocks have been used by conservative dividend investors to generate safe and steadily rising income. Due to the addictive nature of cigarettes, tobacco businesses are generally recession-proof with low stock price volatility, and thus a staple of many retirement portfolios. However, since peaking in early 2018 British American Tobacco's (BTI) share price has plunged over 50%. The stock's severe decline has sent its dividend yield soaring to almost 8%, its highest level in 16 years and nearly double its five-year average yield of 4%. Let's take a look at the drivers behind British American Tobacco's slump and whether the company's dividend could be at risk in the future. To understand British American Tobacco's current struggles, you must first understand its past. Until 2017, British American Tobacco had a 42% ownership stake in cigarette company Reynolds American. Reynolds was formed in 2003 when British American Tobacco merged its U.S. cigarette business Brown & Williamson with tobacco firm R.J. Reynolds, creating the second-largest player in America at the time (behind only Philip Morris USA, which was later spun off from Altria in 2008). Later, in 2014, Reynolds bought Lorillard, a dominant name in popular menthol cigarettes, for $27.4 billion. In 2017, British American Tobacco bought the remaining 58% of Reynolds American it didn't already own for $49 billion. That mega deal, which valued Reynolds at more than $80 billion, brought British American Tobacco back into the U.S. cigarette market after a 12-year absence. Combining with Reynolds gave the company a strong portfolio of brands including Newport, Lucky Strike, Camel, and Pall Mall cigarettes, as well as the Vuse and glo iFuse electronic cigarettes. The Reynolds acquisition also created the largest tobacco business in the world based on net sales. In the U.S. British American Tobacco has enjoyed market share gains, thanks in large part to Newport and Natural American Spirits, two of the fastest-growing premium cigarette brands in the country. Camel has also gained market share thanks to the success of its menthol products in recent years. But if British American Tobacco is gaining market share in the U.S., and its overall sales, free cash flow, and dividend are all growing, then why is the market so down on this company? British American Tobacco's Newport brand dominates the menthol cigarette market, which accounts for close to a third of the roughly 250 billion cigarettes sold annually in America, according to The Wall Street Journal. Unfortunately, the regulatory environment is quickly souring on this part of the U.S. tobacco industry. In November 2018, the Food and Drug Administration (FDA) issued a declaration that could have a substantial negative impact on British American Tobacco's business. Specifically, the FDA proposed a ban on menthol cigarettes and flavored cigars in the United States. The FDA also wants to impose harsh new restrictions on flavored e-cigarettes in retail stores (like gas stations) in order to decrease their availability to minors. That will likely hurt the company's already struggling e-cigarette division, which significantly trails market leader JUUL Labs. This business only accounts for 5% of company-wide revenue but has aspirations to be an important long-term growth driver as smokers increasingly move to reduced risk products. "I believe these menthol-flavored products represent one of the most common and pernicious routes by which kids initiate on combustible cigarettes...The menthol serves to mask some of the unattractive features of smoking that might otherwise discourage a child from smoking." As if the potential loss of its biggest cash cows in the U.S. (the world's most lucrative tobacco market) weren't bad enough, British American Tobacco is facing another major growth hurdle. In May 2020 the European Union (EU) is imposing a menthol ban on that continent, which will likely drastically reduce sales of the company's most dominant brands there as well. The FDA ban is still in the proposal stage, which means it will likely take several years to take effect. The EU ban is set in stone, and will almost certainly dent the company's sales, earnings, and cash flow in 2020. If all that wasn't enough reason for investors to worry, the FDA continues to say that it wants to eventually regulate nicotine levels in U.S. cigarettes to lower them to non-addictive levels. The Family Smoking Prevention and Tobacco Control Act, which gave the FDA regulatory power over tobacco products, forbids an outright ban on cigarettes. However, the agency says that it is allowed to regulate nicotine levels. According to a study by the National Institutes of Health, the typical smoker ingests 1 to 2 milligrams of nicotine per cigarette, and lowering that to 0.5 milligrams would result in a non-addictive product. "FDA’s Center for Tobacco Products has suggested that extended exposure to combusted cigarettes containing tobacco filler in the 0.2 - 0.7 mg nicotine per cigarette range (i.e., very low nicotine content) could be associated with reduced addiction potential, dependence levels, the number of cigarettes smoked per day, and increased quit rates among current smokers, without evidence of increased toxicant exposure, craving, withdrawal, or compensatory smoking." Altria has argued this isn't feasible, and thus in violation of The Family Smoking Prevention and Tobacco Control Act. Thus it's likely that big tobacco will challenge the FDA nicotine regulations in court, but if they lose then the entire U.S. industry could be negatively impacted. Worse still is that big tobacco has been hoping that e-cigarettes and vaping products might serve as a bridge to future growth as cigarette volumes continue shrinking. In the past, the FDA indicated that it would work with the industry to allow them to release more reduced risk products. However, most recently the FDA, in its latest crackdown on e-cigarettes, said that it "won't tolerate a whole generation of young people becoming addicted to nicotine as a trade-off for enabling adults to have unfettered access to these same products." This suggests that the FDA doesn't just see its role as waging an all-out war to kill traditional tobacco products in the U.S., but is outright trying to eliminate nicotine addiction entirely. If true, that leaves the industry, including British American Tobacco, precious little room to pivot its business model in the future. The bottom line is that big tobacco in general, and British American Tobacco in particular, is now facing major regulatory challenges, whose goals are to reduce U.S. smoking rates from their already low levels (14% in 2017 for U.S. adults) to 12% by 2020. ￼Given that high school (the future tobacco consumers of America) smoking rates hit just 9% last year, the FDA is likely to surpass that goal. A future menthol ban will only further reduce U.S. cigarette volumes. The war on vaping is also going to hurt the industry's biggest chance to shift its business model to a fast-growing industry (cannabis remains illegal at the Federal level and there are no indications this will change soon, so big tobacco can't touch it yet). With British American Tobacco facing a multi-front regulatory war of this severity, what does that mean for the safety and long-term growth prospects of its dividend? Is British American Tobacco's Dividend Still Safe? The main reason why British American Tobacco's dividend safety has become murkier is its high debt load and weakening long-term outlook in light of increased threats from regulators. The 2017 Reynolds acquisition stretched the firm's balance sheet. As The Wall Street Journal noted, the firm "spent about $50 billion three years ago to take full control of Reynolds American. In 2016, menthols represented about half of Reynolds's $12.5 billion revenue." Should menthol cigarettes ultimately be banned in America, this deal will not only have been a major waste of capital, but it would leave the company saddled with debt that needs to be serviced by a much smaller cash flow stream than management expected. British American Tobacco has made deleveraging a priority. 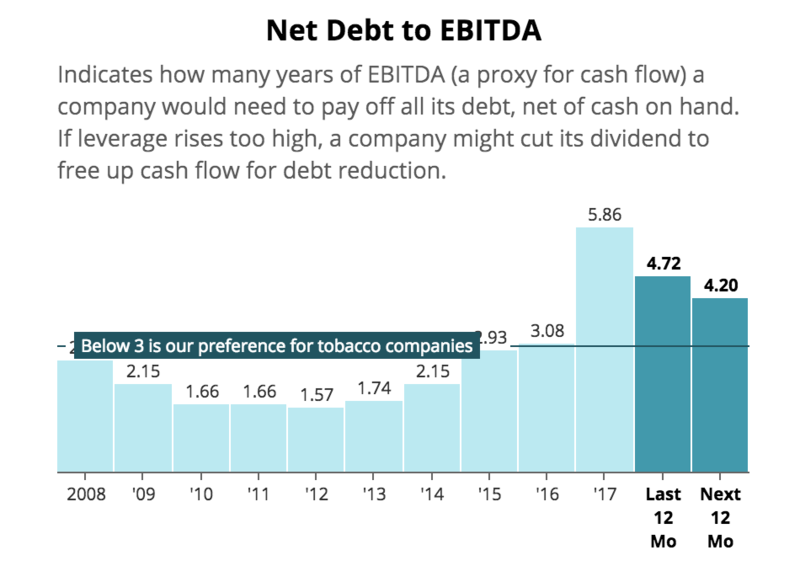 Thanks to the company's excellent free cash flow generation, management hopes to reduce leverage (net debt divided by EBITDA) from 4.0 in 2017 to 3.5 or less in 2019, with an ultimate goal of hitting 3.0 in future years. British American Tobacco still has a strong credit rating of BBB+ but in 2017 both Fitch and Moody's have downgraded their ratings (to BBB equivalent), and Fitch maintains a negative outlook on the stock due to the large debt it took on to buy Reynolds. No matter how you measure it, British American Tobacco's debt load is uncomfortably high compared to its long-term history, so it's essential that the business continues generating enough cash to strengthen its balance sheet. If a company is unable to deleverage as quickly as it needs to, cutting the dividend can free up critical cash flow to speed up debt reduction efforts. At the end of June 2018, British American Tobacco's net debt stood at nearly $60 billion. Through the first six months of 2018, the company reported adjusted free cash flow of about $4 billion and paid out $2.7 billion in dividends, leaving roughly $1.3 billion of retained cash flow that can go towards paying down debt. If those figures are annualized, British American Tobacco would have somewhere around $2 billion to $2.5 billion of retained cash flow to put towards debt reduction this year. A higher amount would certainly be more comfortable, especially since foreign currency exchange rate fluctuations can muddy the total cash flow that's actually available, but management believes the company can hit its deleveraging goals. British American Tobacco's debt load is also staggered nicely to reduce some risk. As of June 30, 2018, the average debt maturity of its bonds was 9.2 years, and no more than 14% of its debt was set to mature in a single rolling 12-month period, reducing refinancing risk. The firm also maintains two revolving credit facilities, each with over $3.5 billion in available capacity. One facility matures in 2019, while the other lasts until 2021. So while the debt clock is ticking, it appears that British American Tobacco has the resources to service its liabilities over the next few years while more clarity over the impact regulatory changes have on tobacco is hopefully provided. The big question is whether the FDA's recent announcement ultimately leads British American Tobacco to want to further accelerate its debt reduction efforts if management believes cash flows beyond the next few years will be uncomfortably low. In that scenario, however unlikely it may be, the firm's $5+ billion dividend could be targeted. Based on what we know today, British American Tobacco's dividend appears to be borderline safe. The company's debt load is worrisome and requires aggressive deleveraging. The FDA's desire to ban menthol cigarettes only raises the urgency to pay down debt. Fortunately, thanks to ongoing cost-cutting initiatives (synergies from the Reynolds merger) and the strong pricing power of cigarettes, British American Tobacco seems likely to remain a cash cow for the foreseeable future. However, increasingly harsh regulations are a real risk dividend investors must watch in this space, especially given British American Tobacco's heavier reliance on menthol cigarettes that might be banned in both the U.S. and EU in the coming years. What's more, tobacco investors need to realize that if the FDA is able to reduce nicotine levels in the U.S. to non-addictive levels, then U.S. tobacco volumes might not hold up as well to such future price increases. Forecasting the likelihood of these risk factors playing out, along with the ultimate impact they will have, is very challenging. We are likely looking at several years of lobbying efforts and legal battles between the FDA and tobacco companies before having a better idea of how the dust will settle. Tobacco stocks have long been safe sources of income in conservative retirement portfolios. 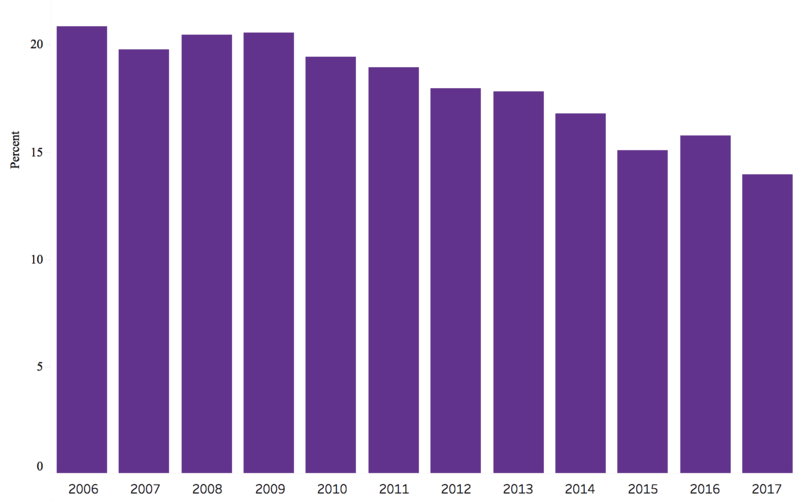 In recent years, far stricter regulatory burdens in both the U.S. and abroad have once more threatened the industry with potentially accelerating declines in smoking rates. British American Tobacco, in particular, is at relatively high risk from the menthol bans that are coming to the EU in 2020 and likely in the U.S. a few years after that. These mounting headwinds certainly increase the risk profile of the stock, but for now the company appears to have the resources to deleverage while also maintaining its dividend, assuming management remains comfortable with the current pace of debt reduction (a more discretionary decision). Overall, British American Tobacco isn't the safest tobacco stock due to its pricey acquisition of Reynolds and the potential nationwide ban of menthol cigarettes in America. While current fundamentals and cash flow generation are solid, some clouds are starting to form on the distant horizon. That's not to say a future thunderstorm is guaranteed, but anyone considering owning the stock must monitor ongoing FDA developments and the company's cash flow in the coming years. British American Tobacco needs to execute on its cost-cutting plans and continue raising its cigarette prices enough to keep its top and bottom lines growing. Otherwise, if the company's confidence in its future earning power weakens, then management may not have the financial resources needed to hit its long-term leverage ratio target of 3.0 without taking a hard look at reducing the dividend. Conservative dividend investors who are uncomfortable with these uncertainties may want to look elsewhere. Within the tobacco industry, Altria and Philip Morris International face some of the same regulatory challenges, but they have much less exposure to the menthol ban risk and far safer balance sheets, keeping their payouts on more solid ground.